How is such bashing and trashing and labeling in any way advancing the kingdom of God on Earth as it is in heaven? How is it that Christians, so many of whom are guilty of such language, don’t consider the language of trashing, bashing, labeling and demonizing as obscene? “God don’t make no trash,” the old saying goes. This we know because Jesus and the Bible tell us so. “Trash” ain’t created in the image of the Creator. so many of the poor among us, the “welfare queens,” the “scumbags,” the “losers,” the homeless “bums” on the corners who “oughta get a job,” undocumented immigrants, the “other” and whoever that despised “other” might be in our superior judgment. That is, whomever in our biased, godless judgments that we dismiss as unfit for our love, or unworthy, perhaps, even of God’s love. God’s will for us is to see all the aforementioned through the corrected vision that Jesus gives us in salvation. And mind you, I’m not saying this is easy. We all have our prejudices and biases. We all are prone to making snap judgments, or rigidly remaining comfortable with our harsh, judgmental and longstanding prejudices. It takes some hard, spiritual work to love others as we love ourselves, to do unto all the “others” as we would have them do unto us. But we can begin this spiritual discipline by dropping all that demeaning and dehumanizing language that even we Christians so casually slap on people that we see or so much as hear or read about. So many among our Christian lot deplore the fact that nasty, obscene language is now part of culture and public discourse, and I’m in with that. My parents would be appalled at the casual, widespread use of vulgarity, especially the “f-bomb,” everywhere we turn. But all the aforementioned words (trash, scumbags, bums, etc. )–is this not equally “nasty language” from our lips to God’s ears????? Jesus could be fiery and harsh and righteously indignant, mincing no words in his condemnation of hypocrites. How is the language of such bashing and trashing of the poor (especially those who’ve known nothing since birth but government dependency and the deadening cycles of poverty), the homeless, the beggars, the outcasts, the marginalized, the downtrodden and the down-and-out–the very people that Jesus attracted and desired to attract–how is that conducive to evangelism? How does such labeling and isolating pave the way for showing anybody the way to new life in Christ? Christians, everyone we see with our supposedly Christian eyes–no matter how dirty or “trashy” we see them as being–no matter how ugly or shiftless or lazy or violent, whether it’s the prisoner on death row or “those people” across the tracks or down on the city’s toughest side . 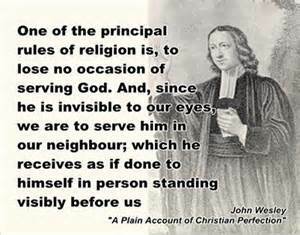 . . even they are what John Wesley described as “the offspring of God” and “candidates” for eternal life with God. The dirt-poor beggars, the shunned and despised outcasts, the alleged “losers” of the world–John Wesley was about as good a friend outside of Nazareth as “those people” ever had. Wesley believed that when we genuinely attain new life in Christ–when our blindness is cured in salvation and we can see as if for the first time–we see anew because salvation comes with what he described as spiritual eyes. “A poor wretch cries to me for alms: I look, and see him covered with dirt and rags. But through these I see one that has an immortal spirit, made to know, and love, and dwell with God to eternity. I honour him for his Creator’s sake. I see through all these rags, that he is purpled over with the blood of Christ. I love him for the sake of his Redeemer. “The courtesy, therefore, which I feel and show toward him is a mixture of the honour and love which I bear to the offspring of God; the purchase of his Son’s blood, and the candidate for immortality. This courtesy let us feel and show toward all and we shall please all men to their edification” (“On Pleasing All Men”, Works, VII: 145). If there was anything in this world that John Wesley hated it was slavery–an institution that he denounced and fought against with a fierce passion. This at a time, of course, when it was considered a biblical given that slavery was sanctioned from on high, and African slaves were considered less then human. “Are not these [slaves] also the work of thine hands, the purchase of thy Son’s blood? . . . Thou Savior of all, make them free, that they may be free indeed!” (“Thoughts Upon Slavery”, Works, XI: 79). So let’s stop with the trashing and start up some conversations about how to build more bridges and fewer walls. Thank you for powerful, prophetic words. We must pay attention to the language we use that routinely dehumanizes others. Thought-provoking and well-written. Not that the above terms should be attached to anyone, but it should be noted that a small percentage of individuals have chosen to play on the sympathy of others in order to get money to spend on alcohol or other harmful items. This has led to a detached attitude among some and the belief that many people they see standing on corners claiming to be veterans in need are not, or claiming to be homeless mothers with children are not. It’s unfortunate because this handful of individuals not only hinders to a many people in need from others, but it hardens the hearts of many people who at one time were open to offering such assistance. 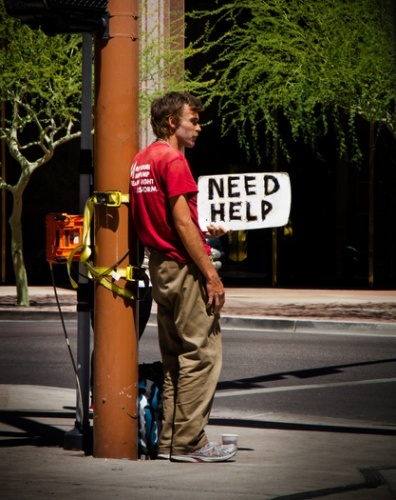 No one wants to give money to someone perceived to being in need and later see them walking into a liquor store. Very well said! I was appalled when I recently learned that many of our enlistees in the military are eligible for food stamps. Also, many folks working at minimum wage jobs do not make enough to get out of the poverty level. The former (but quickly disappearing) working class, people such as construction workers, plumbers, or electricians are often eligible for assistance. At the expense of sounding like an socialist, we badly need a redistribution of wealth in our country by forcing the ultra rich and the corporations, that are now people with religious views thanks to ‘Citizens United’ and ‘Hobby Lobby,’ to pay their fair share of taxes. It is a travesty when the middle class pays higher rates on their taxes than the wealthy.